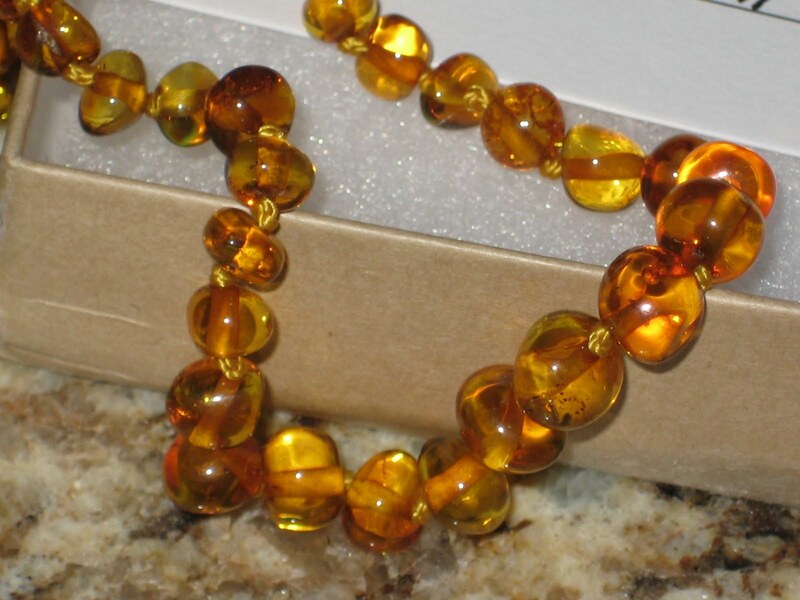 Inspired by Finn sells Baltic amber and hazelwood jewelry, including the beautiful teething necklace I was given to review. 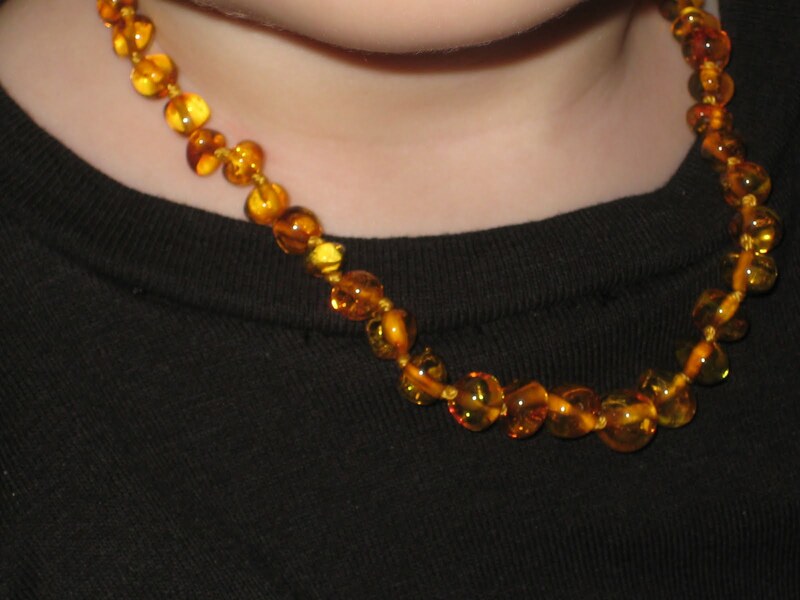 The first time I heard “amber teething necklace” I thought people must be nuts. 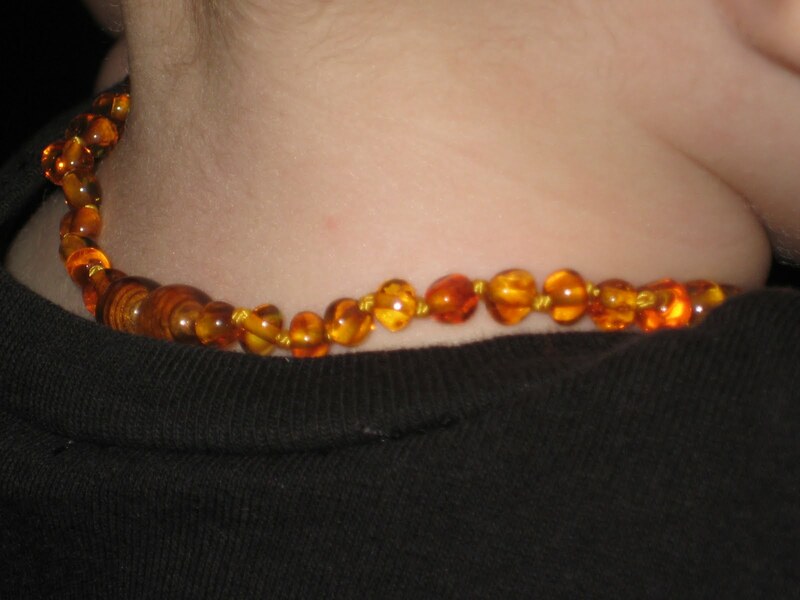 Then, I learned about the benefits of Baltic amber. I figured out that no, people weren’t allowing their children to chew on jewelry. When Baltic amber is worn on the skin, the skin’s warmth releases trace amounts of healing oils from the amber. These oils contain succinic acid and are absorbed into the skin. 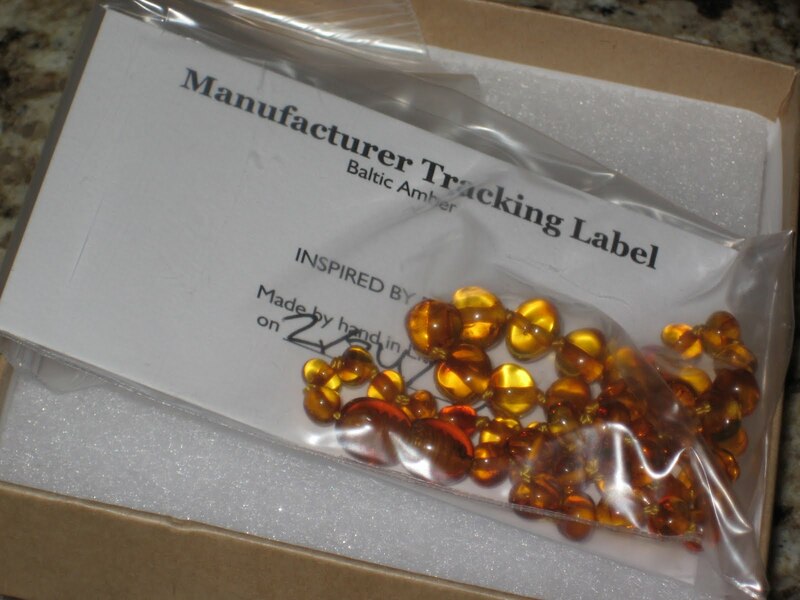 Read more about the benefits of Baltic amber and check out the available shapes and colors. I asked Inspired by Finn to choose the shape, color and length of my son’s teething necklace for me. It came in a cute gift box. All jewelry is lead-free and phthalates-free and it meets all US legislative testing (CPSIA) requirements for children’s jewelry. Each bead is individually knotted and while it isn’t “stretchy,” it does have a tiny bit of “give” to it. It will break if pulled, which is good for safety’s sake. Even so, I, personally, did not put the necklace on my son for naps etc. The necklace has an easy to use, secure closure. After I took these photos, I tucked the necklace under his shirt, so it was in contact with his skin. The necklace is absolutely beautiful, and I want one for myself, if only because it is so pretty! I couldn’t resist taking this photo, he gave me the biggest grin when he saw the camera! My husband says he looks like a hippie, and the cashier at Old Navy thought he was a girl. My mom said it was because of the necklace, but several weeks ago, a Dad at the park told me he was “too pretty to be a boy” because of his big brown eyes and long lashes, LOL. I think he looks adorable! I can’t really say whether it has eased his teething pain. 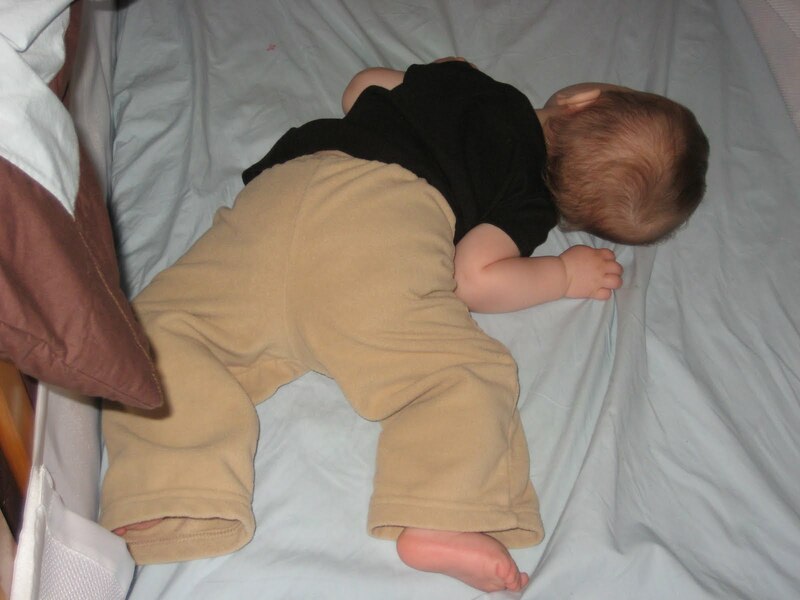 However, since he started teething, he has never really napped. After wearing the necklace, he napped for an hour and a half!! So yeah, I love my Inspired by Finn teething necklace! Want it? Buy it. Use coupon code BLOG68 for 20% off your entire order! Or, win it! Inspired by Finn will send the winner of this giveaway one item 16 inches or SMALLER that is in stock. 1. Visit Inspired by Finn’s store and select the item (16″ or smaller and in stock) you would like to receive (mandatory entry). 2. Follow my blog (current followers count). Comment saying you’re a follower to get your entry. 3. Fan me on Facebook (current fans count). Comment saying you’re a fan to get your entry. 4. Blog about this giveaway and link back to me. Comment with a link to your blog post to get your entry. 5. Follow me on Twitter. Comment saying you follow me. Note: Inspired by Finn has a Facebook page now. It would be awesome if you beame a fan, but I can’t add an entry option for that this late in the game, since it wouldn’t be fair to those who already entered. I will accept entries until Sunday, May 2nd at 9 P.M. EST. I’ll use random.org’s random number generator to choose a winner. Please make sure to leave your email address in your comment if it isn’t in your profile. Thank you to Inspired by Finn for providing the products for the review and giveaway. The freebie in no way influenced my review. Edit August 2010: We stopped using this when my son kept lifting it from under his shirt, over his chin and putting it in his mouth. I have been wanting to buy a short one but haven’t yet! >I like the Amber disc and my son definetly needs this! >Love the Honey Pendant necklace. >http://ourkeirabelle.blogspot.com/2010/04/great-blog-great-giveaway.htmlMy blog post and it's posted on FB! >I would probably get the Congac Round in 13inI've heard about the teething necklaces but DH doesn't think it'll work…But with how much teething is causing my DD to go through, I'm almost to the point I'd try anything! Although if it were a giveaway – DH couldnt' complain and I could prove him wrong! >I would love the pumpkin and butter for my daughter. >I'm a fan of yours on facebook! >I would get the brownie chips necklace. >I like the Honey Round necklace, I think the color is beautiful! This would really come in handy, my little man is teething right now and the poor guy is constantly chewing on his fingers or anything he can get in his mouth! >I like the Amber DISC necklace and the cognac bracelet. >I like the butter round necklace. It is cute.